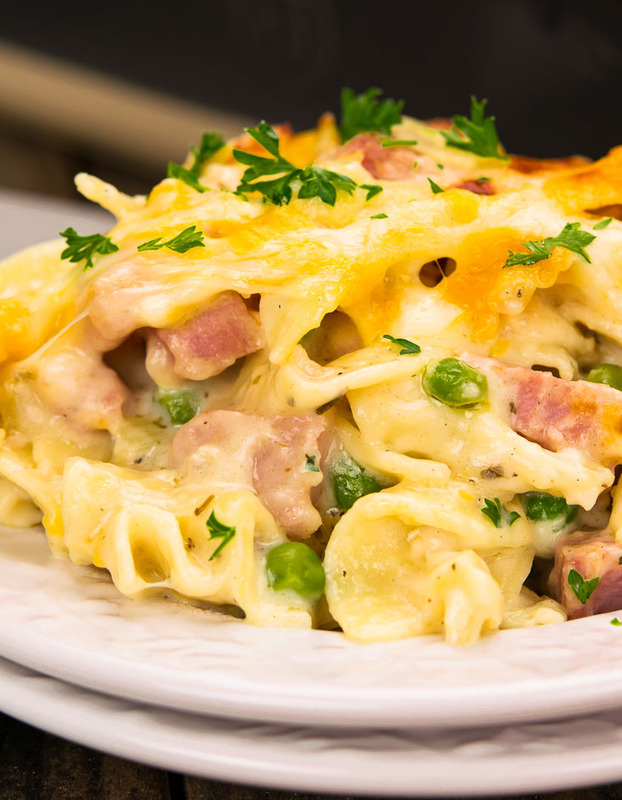 This tummy-tempting homemade Ham Casserole is a smoky, salty chunk of ham mingles with curly ribbons of pasta in a decadent cream sauce loaded with cheese. 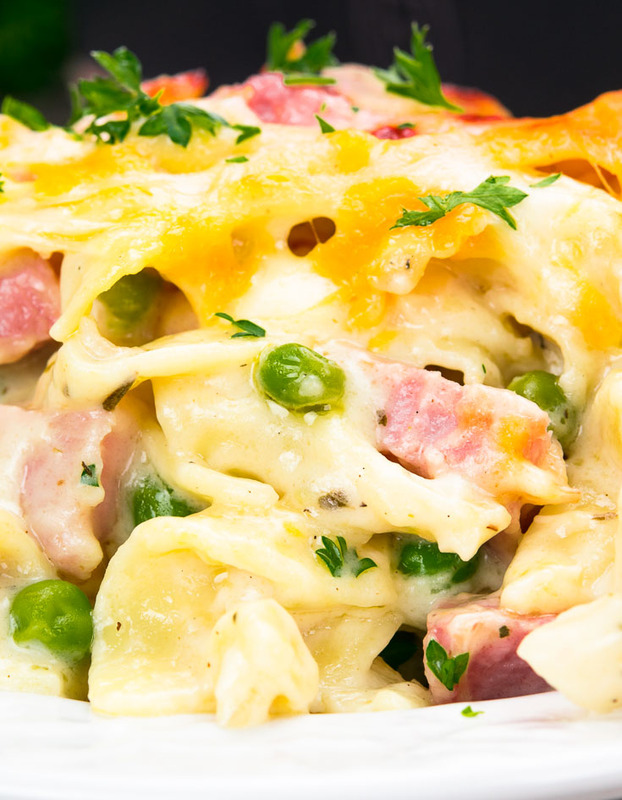 You won’t find any green eggs here, but you’ll want to eat this hearty Ham Casserole everywhere! Baby, it’s cold outside, or at least it’s dipped below 90 degrees, which means it’s casserole time at my house. If you’re a regular visitor to my blog you know I’m a huge fan of quick and easy casseroles. Store-bought convenience items like canned soup are life-savers on busy nights when I want to get a delicious dinner on the table but don’t have the time to fuss over something more complicated. 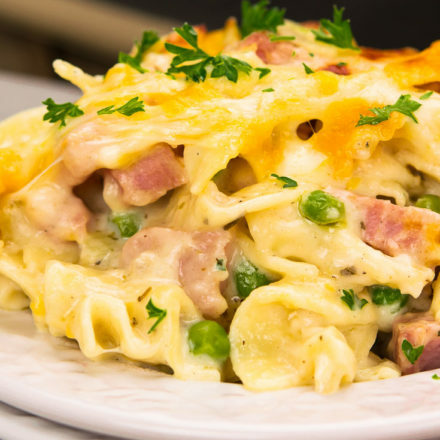 Sometimes, though, I do have some time, and I’m able to indulge in a craving for something really special, a wonderful, homemade noodle casserole smothered in a luscious, velvety sauce and loaded with smoky chunks of ham. This is that casserole, baby, and you’ll want to make some time for this one in your kitchen too. Ham casserole recipes are as varied and numerous as the recipe books on my bookshelves. Other than ham, they do all have one thing in common – carbs, glorious carbs! You’ll find ham and rice casserole, ham and noodle casserole, and ham and potato casserole (including a ham casserole with hash browns). If you’ve brunched at someone’s house, like ever, you’ve probably had a ham and cheese breakfast casserole. It’s usually a ham potato casserole, meat and potatoes settled into an eggy mixture of cheese and the obligatory canned soup. Like bacon, ham seems to be relegated to breakfast fare in these casseroles, but you don’t have to just make a breakfast casserole with ham. You can make one for any meal of the day! So what’s the best ham casserole for those other two meals? Well, I’ve never met a carb I didn’t like, and I’m definitely a potato fan when it comes to breakfast, but that comfort-food fantasy for me is definitely a ham noodle casserole, with ruffles of perfectly cooked pasta swimming in a rich, flavorful béchamel, studded with chunks of ham and so much cheese that each spoonful clings to the utensil like its life depends on it [wipe drool off mouth]. Like I said, this is THE casserole to rule all others, and, to answer the question, my ham casserole recipe is the best! Although this dish has all the tender love and care of a truly homemade meal, the only real effort required is putting together the creamy conduit that marries the ham and noodles. It’s a simple béchamel, with an aromatic base of celery, onions, and garlic. You’ll notice I saute these in oil, then add butter when it’s time to make the sauce. Unlike butter, the vegetable oil, with its high smoke point, lets me cook the aromatics long enough – and high enough – to extract all the flavor without worrying about it burning. I do add the butter later, though, because the béchamel really benefits from the richness. That’s why I also suggest using whole milk instead of a reduced fat version since it definitely affects the mouth feel of the sauce. I know some recipes take the richness to the next level by using heavy cream or sour cream, but I think both make this dish a little too heavy and the tangy quality of the latter actually competes a bit with the other flavors in my sauce. Those additions are a good glug (that’s my technical term) of Worcestershire sauce, which deepens the flavor with all those magical ingredients they put in that stuff, plus a little Italian seasoning. Again, my regular readers know this is really a multi-purpose, frequently used spice blend in my recipes because of the complexity just a few shakes can impact on a dish. The earthy qualities of the oregano, the brightness of the thyme, and the licorice flavor of the basil turn this into so much more than your average cream-of-whatever soup base. Once you taste the difference building all those flavors into the sauce makes, you’ll skip the only-slightly-simpler ham casserole cream of mushroom version. Every great casserole needs a generous amount of cheese, and I like to mix some into the sauce, plus save some to get brown and bubbly on top of the casserole. Using pepper jack is another little spin I put on other ham pasta casserole recipes. Jack cheese has a lovely, creamy texture, especially when it’s melted, and the peppers bring a subtle heat that adds that little “something special” to the dish. Even with the cheese coating, you may have bits of noodles peeking out on top that can get brown and crunchy in the oven. I happen to covet those little crispy bites, but you can keep the casserole covered with foil for half the baking process if you’d rather preserve the soft texture. This is a great recipe for using extra ham after a big holiday meal, though I’d stay away from any honey or brown-sugar-glazed leftovers since the sweetness doesn’t work well in this recipe (be sure to save the ham bone too for this hug-in-a-bowl Ham and Bean Soup). If you’re like me, you may even have some in the freezer you can use since I often cube and freeze leftover ham for casseroles or quick breakfast scrambles. Speaking of freezing, one of the (many) things I love about casseroles is they often freeze well, and this Ham Casserole is no exception. You can double the bang-for-your-buck by enjoying half for dinner, then freezing the other half for a quick meal that just needs thawing and reheating. 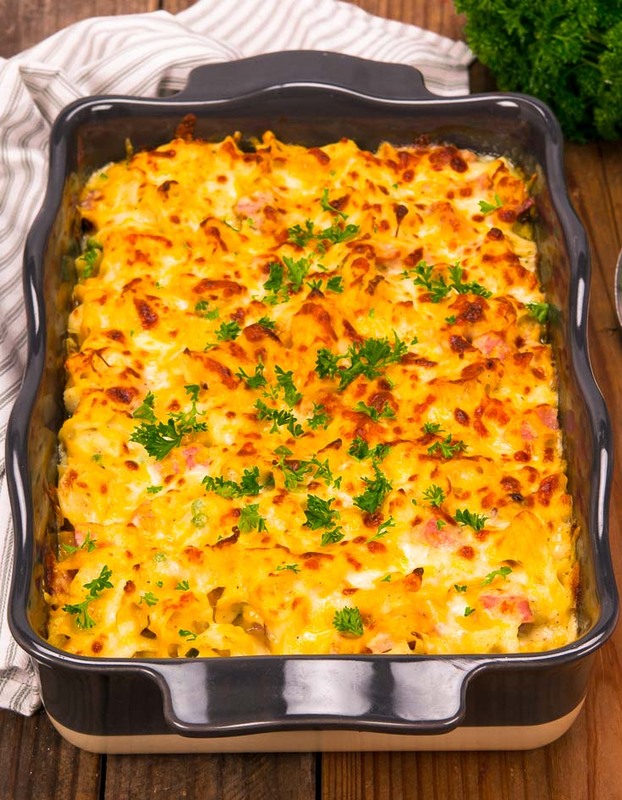 Whether you’re indulging in a craving like me or just looking for some killer comfort food, you’re going to love my Ham Casserole! 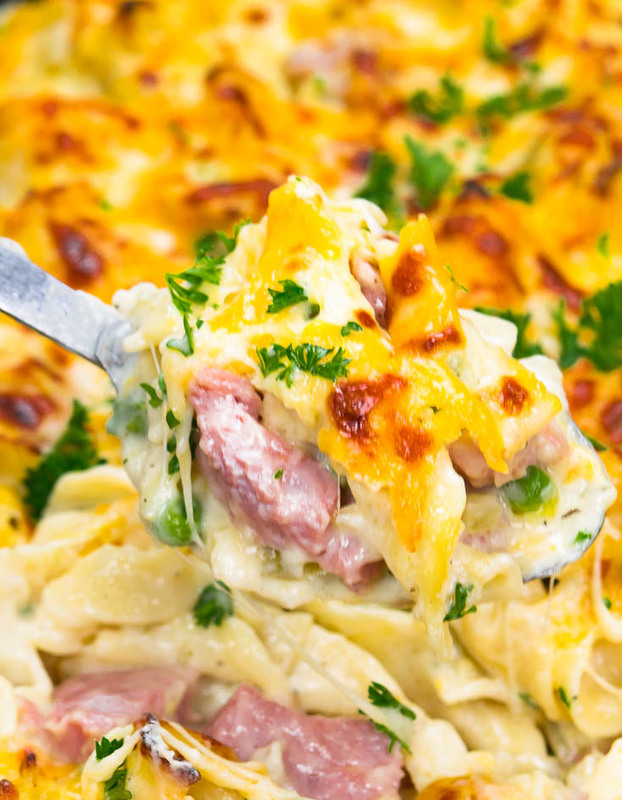 This tummy-tempting homemade Ham Casserole is a smoky, salty chunk of ham mingles with curly ribbons of pasta in a decadent cream sauce loaded with cheese. Preheat oven to 350 degrees. Spray a 9 X13 inch baking dish lightly with nonstick cooking spray. Cook Egg Noodles in salted water according to package instructions. Drain. Meanwhile, in a high sided large skillet, table oil and saute onion, celery and garlic, over medium heat, until soft, about 8-10 minutes. Add the butter to skillet and melt. When the butter begins to bubble, sprinkle the flour over the top and whisk over medium heat until evenly combined. Cook, stirring constantly, for 1-2 minutes. Remove skillet from heat and slowly whisk in milk. Return to medium heat and cook until mixture begins to bubble and thicken. Reduce heat to low and stir in Worcestershire Sauce, salt, pepper, Italian seasoning, 1 1/2 cups Monterey Pepper Jack cheese, and thawed peas. Add drain pasta and ham to the skillet and combine well. Pour into prepared baking dish. Sprinkle top with remaining 1 1/2 cup cheese. Bake in preheated oven until heat through and bubbly, about 25-30 minutes. Pasta options – I love egg noodles in this dish mainly because the pasta ribbons just make me happy! If you need to substitute for some reason, though, I’d suggest using fettuccine and breaking the pieces into quarters before you boil them. If you want to make a healthy ham casserole (or at least a healthier version), you can use a whole wheat or whole grain noodle. Pea haters – Peas are optional. I love them in this dish, but it seems there are a few people who were traumatized by them as a child. Who knew?! Feel free to omit them, if you want. You can actually substitute some chopped broccoli (either blanched or frozen-then-thawed) as a nice, nutritious pop of color. Choosing cheese – My favorite cheese for this recipe is an extra sharp cheddar, but you can substitute a plain Monterey Jack, mozzarella, or even a pepper jack with awesome (and equally cheesy!) results. Chicken Broccoli Rice Casserole -Chicken, rice, broccoli, all baked in a super, creamy, easy sauce, topped with lots of gooey cheese and buttery bread crumbs. I think that this is the BEST casserole I have ever made and at 65, I have made a lot of casseroles. Thankyou! What step do you add the ham?